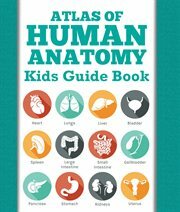 The item Atlas of human anatomy : kids guide book, [Speedy Publishing LLC. ], (electronic resource) represents a specific, individual, material embodiment of a distinct intellectual or artistic creation found in Richland Library. Science is a favorite subject of many children due to its visual lessons, and the way the subject taps into their imagination and natural desire for exploration. This atlas of human anatomy makes the oft complicated subject fun and easy with a design that is tailored specifically to the various learning styles of children. Order your copy now!